It is an Independent Dynamic exclusive website for Library and Information Center.
" 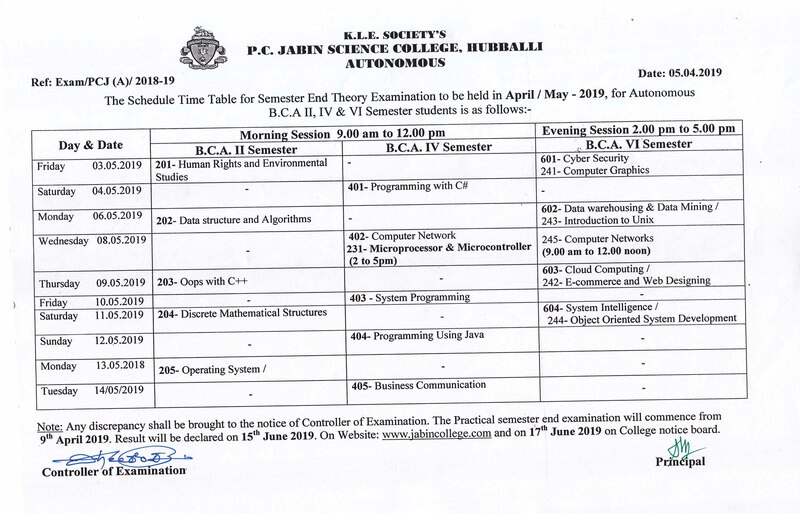 Admission for B.Sc and BCA first year are commenced from 25th April 2019, The application forms and detailed information can be obtained from College office during office hours." An IQAC Initiative Workshop on “An Insight into Management Information System for Accreditation” Under UGC - CPE - PHASE –III Is scheduled on 12th February, 2019. October 2018 special exam results are declared and results are displayed on college notice board. B.Sc VI semester students of the academic year 2017-18 may avail the marks card from office of the college. Orientation Programme for B.Sc I semester A & B division students is scheduled on 25th July 2018 and for C & D division students on 26th July 2018. Registration starts at 8.45 am at Gymkhana Hall. It is compulsory to all the B. Sc I semester students. M.Sc. Admissions for Biotechnology, Chemistry, Computer Science and Physics are open. Applications are available at college office. B. Sc and BCA all Semester end Practical examinations (2017-18) are commence from 14th May 2018. Schedule is displayed on the college main notice board. 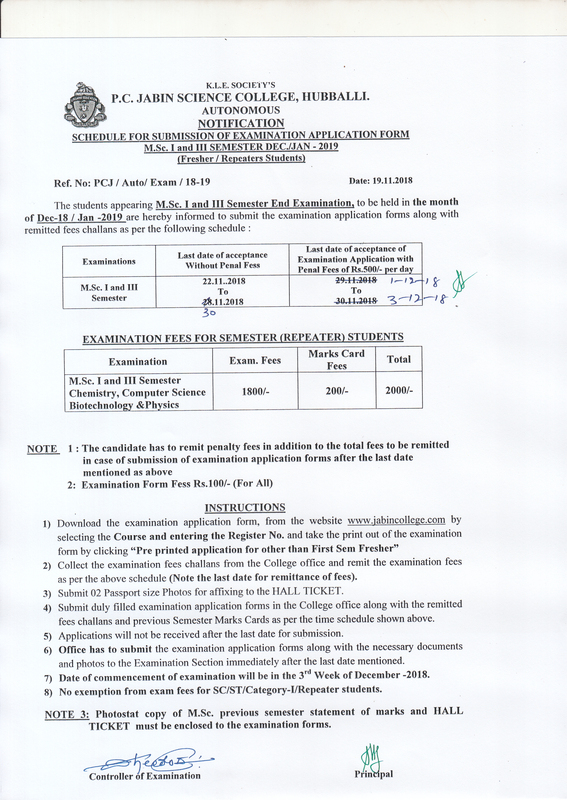 Admissions are open for B.Sc. 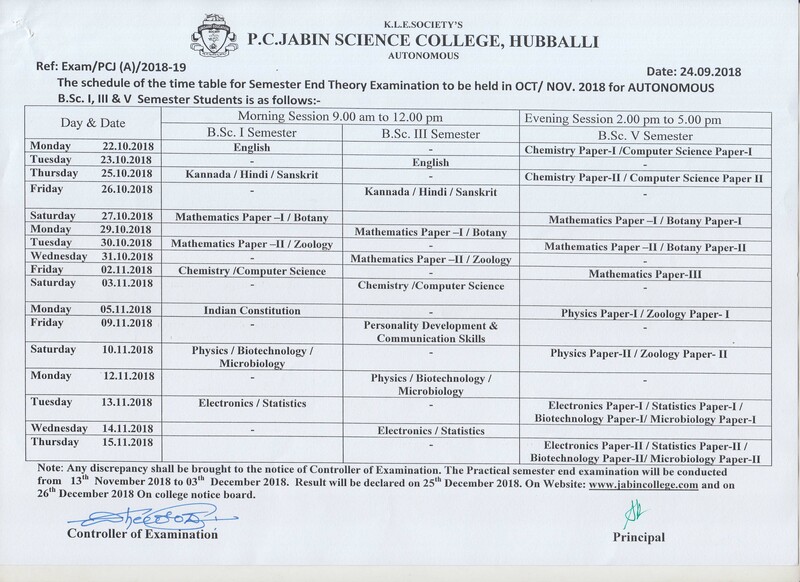 first semester in 14 combinations for the academic year 2018-19. Brochure may be downloaded from the website. Autonomy of the college has been extended for further five years (up to 2023 by UGC, New Delhi. 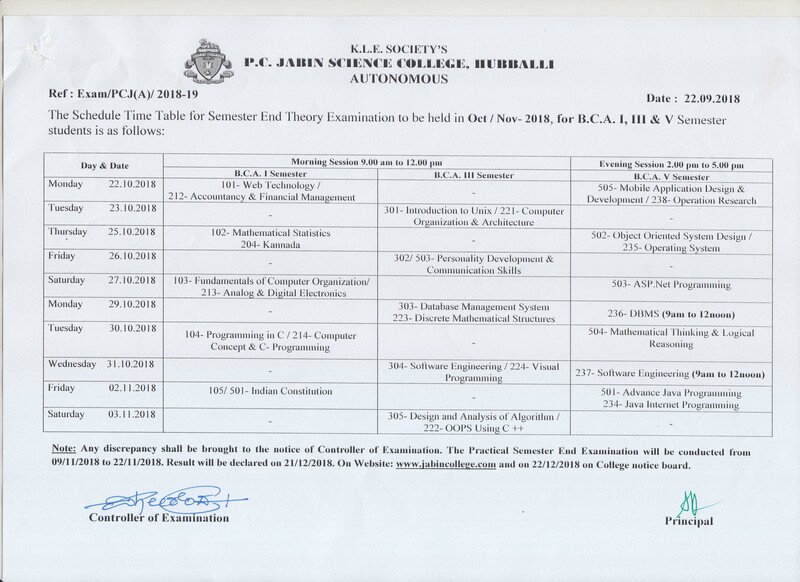 Even Semester End Theory Examination for B.Sc and BCA is scheduled from Tuesday, 24th April 2018 to Monday, 11th May 2018. 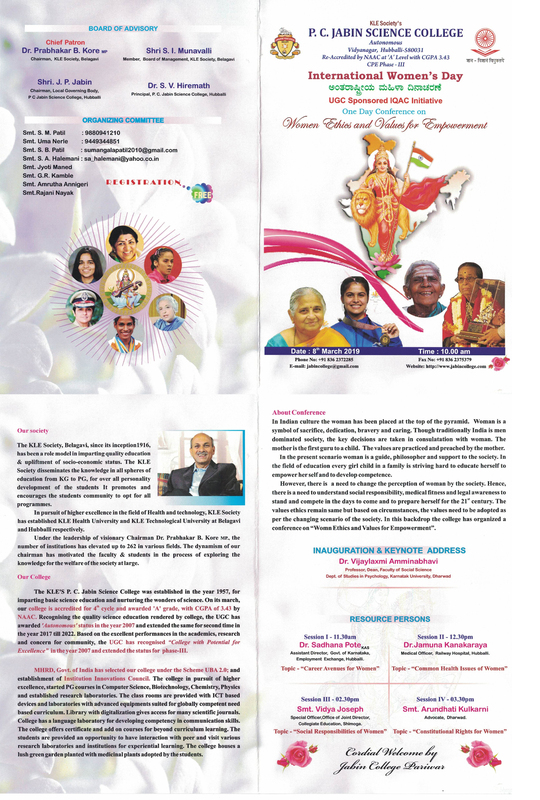 The details of the schedule available in the downloads. Congratulations....Shri. Shankar Adarakatti amd Miss. Nikhita Pujar of B.Sc VI semester students of our college have represented India in World Yoga Sports championship-2017 competition held at Abudhabi, UAE on 30th December 2017 and have won Gold medal. KLE Management, Principal, faculty and students of P. C. Jabin Science College has complemented the proud students for their great achievements. Congratulations, P. C. Jabin Science Autonomous College has secured "A" grade with 3.43 CGPA by NAAC in the 4th Cycle Accreditation. Dr. Prabhakar B. Kore, Chairman, Sri. 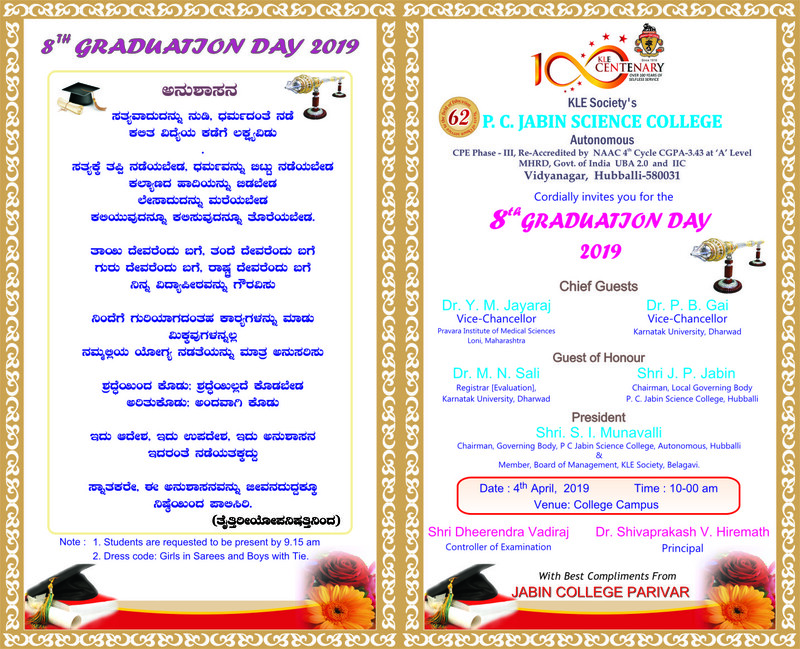 Shankaranna I. Munavalli, Chairman Nominee and Members, Board of Management, KLE Society, Belagavi have complimented the Principal, Faculty and students of the PC Jabin science College. 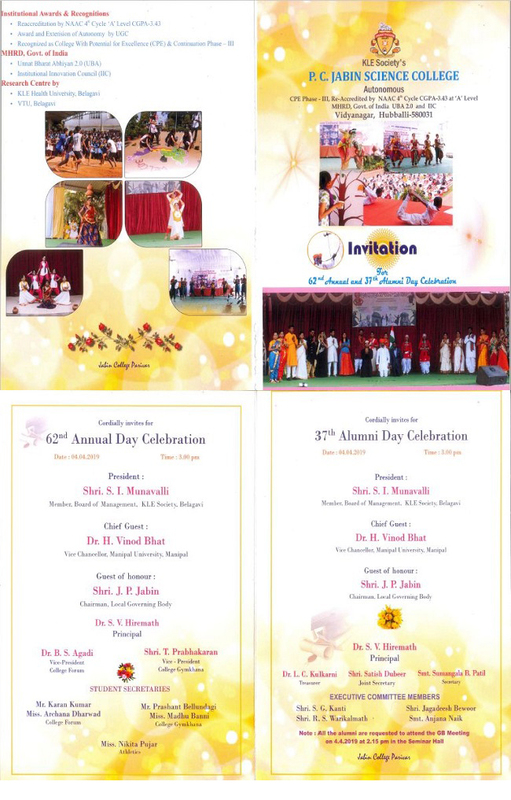 "8th Graduation Day is scheduled on 04th April 2019"
" 62nd Annual Day & 37th Alumni Day is scheduled on 04th April 2019".
" 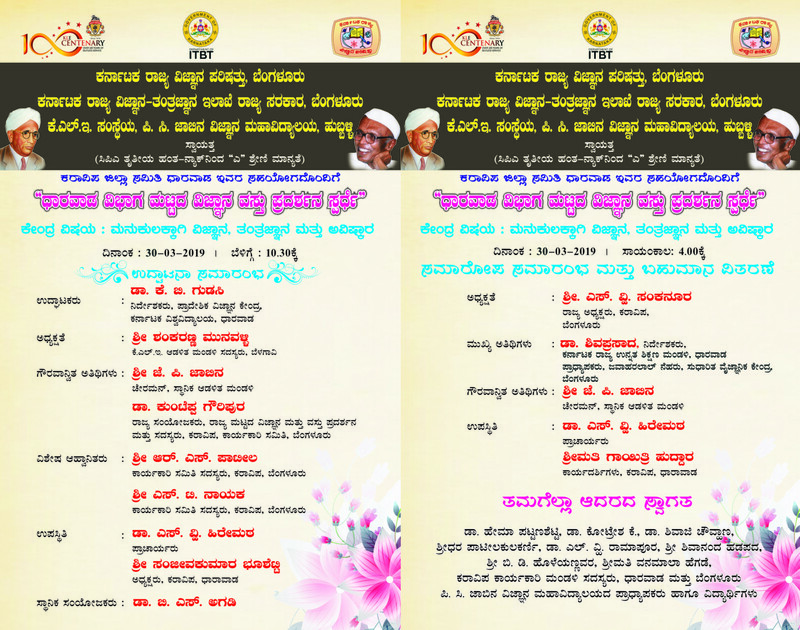 KRVP Zonal level science exhibition is Rescheduled on 30th March 2019". Techradiance-19 in association with Techfest IIT Bombay Organizes workshop"Mobile Controlled RObotics"
It's an event that makes K L E Society feel proud, recently our chairman Dr. Prabhakar B. Kore, has completed 33 fruitful years as chairman of the society. He has been serving the society as chairman from 16th May 1984.